Efudix is a strong topical medication with over 40 years of documented success in treating precancerous sunspots on the skin (actinic keratoses) and some superficial skin cancers. 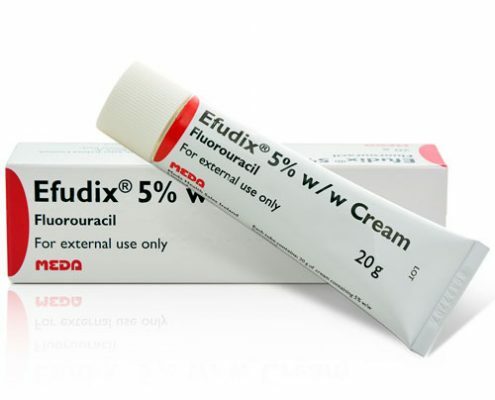 Efudix contains 5-fluorouracil and is a topical chemotherapeutic agent which treats actinic keratoses by destroying the abnormal cells that make up lesions. During the two to four weeks which make up your treatment time, your skin will most likely feel and look worse before it gets better. Do not be alarmed. The redness, crusting and peeling are caused by the death of the abnormal cells. This is perfectly normal during Efudix therapy and is a good sign that the Efudix is doing its job! We will hold your hand through the challenging treatment period and we urge our patients to pop in or send photographs if you are at all unsure whether your response to the Efudix cream is too extreme. We always recommend that you pop in after two weeks of treatment to assess the need to continue treatment or whether your response to the cream has been adequate.